Today, we talked to Jay Liotta, the chairman of American Chamber of Commerce in Mongolia, about Mongolian economic situation, investors’ concerns, IMF, and Erdenet Mining Corporation. Welcome to our studio and thanks for coming. So, let’s see in AmCham’s roadmap to grow 2017. There are four target areas for this year. Financing, economic diversification, legal environment and investment promotion. So first of all, in financing, what all the opportunities? Sure, but maybe I step back for a moment and just kind of explain how our roadmap works. 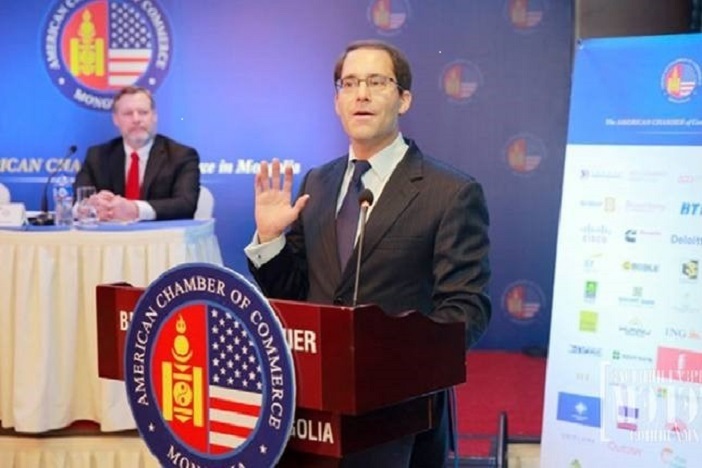 The mission of American Chamber of Commerce in Mongolia is to build, strengthen and protect business relationships between the United States of America and Mongolia. And also to promote Mongolia as an investment destination for American investment to come into Mongolia. The board of directors and I strongly feel that many of Mongolia’s social, economic and health issues including the current pollution crisis can be resolved by a strong private sector and businesses operating in Mongolia. For Mongolia to succeed, the businesses must succeed in Mongolia. Based on that philosophy, every year we put out a roadmap for growth. That’s our policy document which really says here is what we are going to focus on this year to make business successful. As identified in our 2017 policy document, which of course is here. In this we identified 4 key areas. Financing, economic diversification, legal regulatory reform and business and investment promotion. On the financing side of that, what we are really aiming to do is to get cheaper and more competitive financing for our members. So we’ve got our traditional roots which are international development finance institutions such as OPEC. They oversee private investment corporation of the United States which is investing millions of, millions of dollars in Mongolia and what is to invest millions of millions of dollars more. There also the export financing institutions such as US Exim bank which helps to export US products to Mongolia and provides cheaper financing to make that possible. Something we are going to be pushing very hard this year, probably during our trade mission in June to Washington DC and probably New York as well is putting our members in touch with venture capital funds in United States. Investors who wants to invest in equity or debt in Mongolian enterprises to really get the money flowing in here to encourage business in Mongolia. That’s the financing side of what we are aiming for. So we know that Mongolia needs to diversify economy to avoid recession. So who AMCHAM will support it? Sure, well for economic diversification, we are looking at many sectors. But we’ve got a key focus on the Agriculture sector and the energy sector. In particular, the renewable energy sector. And our members have the most innovative, best technology, know-how and work ethic to make Mongolia’s sectors world class and internationally competitive. And when you have an internationally competitive sector, you are going to attract investment. So by partnering with the members of AMCHAM who are in these sectors, it is really going to help bolster economic diversification by making the sectors world class. We are also looking at franchising. You can see Pizza Hut, KFC, Holiday Inn, Ramada, Hard Rock Cafe. There are lot of US franchises which are coming into Mongolia, partnering with Mongolians. So we are going to help our members meet more franchising opportunities. We probably go to franchising convention in New York city in June to help to do that as well. And we’ve got our Agricultural Standing Committee in the American Chamber of Commerce, which is really working to push regulatory reforms at the sectors are viable for business. Let’s see in legal environment. So are there any specific areas to focus on for Amcham? Legal regulatory is a very big area. We believe a cornerstone to attracting investment and having successful business in Mongolia is having a good legal and regulatory environment. At the same time, over-legislation or over regulation is a bad thing. That will chase out businesses. And that will chase out investment. So several things that we are looking at. I will start with deregulating the economy. We want less regulation, we want less laws, we are prescribing how the private sector must behave. And we want the state out of private sector business. The state should regulate business but should not be in business in order to businesses to succeed here. There are areas that we look out of course are sanctity of contract, rule of law, tax legislation. We need official tax interpretations so that people know exactly what to expect from their doing business here. All too often, tax inspectors will come in and say you know all these taxes, here is your fines and penalties and it causes huge problems in transparency. This year something that we are doing is for setting up a financial committee or financial services’ committee which will focus on giving policy advice to Government and our members as we go through a bit of a rough part of Mongolia’s history now in terms of its financing. Legal and regulatory also it would be nice for the generalized system of preferences in the US, to lobby in Washington to make so certain goods in Mongolia can go to America duty free. So that would help enhance the ability from Mongolians to export to America. Assets also legal and regulatory general as well. How about an investment promotion? Are there any specific events or something this year? We’ve got several lined up, we’ve got full agenda. In April, we’ve got an Asia Pacific Council of American Chambers of Commerce event. That will be in Guangzhou, China this year. It will be 28 American Chambers around the region convening in one place with investors and businesses to discuss business in the region, and the business scenarios individual jurisdictions. In June, we would be leading our trade machine in Washington DC, probably New York perhaps in Silicon Valley as well. I am very pleased to announce this year honorable ambassador from United States of America to Mongolia Ambassador Galt will be leading our trade mission, she is going to help make introductions to the new administration in Washington, as well as to help us to promote Mongolia as the destination for business investment. Another initiative what we are doing which is very important is where China build success stories. So we are going turn member saying tell us what success you’ve had in 2016 and leading in the 2017. And if you haven’t had a success in Mongolia then you tell us why not and let us advocate for you. Let us go to the government or to the private sector wherever you take, so you can have success. And we want your success story and we’re going to publish a booklet. And then we go to Washington or Hong Kong, or London all the places we go to we’re going to go to people so you can do business in Mongolia. Here is examples how you can, how you can be successful, because we really need success story out of Mongolia in order to change this narrative that you can’t do business in Mongolia. So we’re really going to be marketing and pushing that as well. Let’s shift the focus on local hot headlines, maybe is sure. The government is currently in negotiations with IMF for a bailout. So, what is take on the how would effect in investment environment, maybe? I think it have a positive effect. As long as we fully understand what is happening. And that is really going to be up to the Ministry of Finance and to the IMF to clearly communicate to the private sector, the business investment community what is this deal is why destruction the wait is. We came out months ago saying IMF deal would be better than a bilateral deal with China or Russia or Japan and perhaps in the US because there are strings attached to the those which are can be very difficult. And IMF deal tries to put pressure on the local government here to clean up the was in regulations to create transparency so we don’t have these problems again. And so the IMF program should have to do that. Now we are going to like what has to be done necessarily, but are we going to have to leave with certainly. And you know, some mistakes have been made in past year, policy decisions. We should really put all of us the Mongolian people and all of us who live here in very bad position. And so we are probably in a face tax raises, probably going to do face issues of paying back to bonds on the time and the DBM bonds. And we are just going to have to had clear communication is to why this is happening, and how things getting better in improvement. So we expect with the IMF agreement come out within this week. So while I loan from Japan is expected carry higher interest rate compared to one from the China. It would also incur less political some economists say we are sure that is so. How about loan from the United States, is there any opportunities? As I recall the United States government, and it is for mission here in the embassy. This is the only one there is come out saying we’re supporting Mongolia in terms of its discussions with the IMF. And moving the country forward. We are very forward focused. You know, it is easy to go back and do an autopsy of why we are in such bad position we are in and to blame people and trying tear things down. But that gets us to nowhere. So we are looking for a forward direction. And the U.S. government has for what i understand really stepped up to say we’re going to do what we can do to help Mongolia out of this crisis. Certainly the American Chamber of Commerce in Mongolia, the U.S. Chamber of commerce in Washington DC and the Asia-Pacific Council of American Chambers of Commerce is very interested in helping Mongolia to move forward. So i think there is a lot of support coming out of United States in public and private sector. And we are look forward to working with Mongolia on that. We are all optimistic about repayment bonds. But we need more investment of course. How can we improve the investment environment? And how can we support private sector? Not from the U.S. but in a broad range? I think a lot of that goes back to our “2017 Roadmap for Growth”. A legal and regulatory environment encourages investment, encourages private sector business, encourages deregulation, removes the state and parliament from dictating business practices. All of this things will be a plus to bring people in. As well as success stories. If you are an investor sitting in New York I always say investors are not complicated people. They just looking hey can I do business there? can I get return here. If so ok here’s the check. If they can see success stories where people are actually having proven success, not hyped up, not smoke mirrors magic shown success but real success in Mongolia when they’re going to say “Hey I’ll give it a try”. And that’s how we get it back here. But it’s going to take time. Very quickly, unwound what had been created we saw the power of the private sector when economy was blooming here. People had jobs, your happiness levels were higher. But in a very short period of time that was destroyed by policy decisions here in Mongolia. To rebuild that people are going to look at not only new legislation coming out because we always see that new government comes in oh we’re going to pass this new minerals law, we are going to pass new arbitration law, we’re going to pass this this this. Ok that’s nice, that’s great. But we need to see 3 or 4 years when it is actually followed. And behavior here is consistent with what the law says. And that will build back confidence, and that will bring back investment. And we need to start today. We might start today and move it forward. I would like to mention about the concern about the Erdenet copper mine in this interview. Parliament approved the resolution to nationalize that copper mine last week. So the Mongolian Copper Corporation also the business sector is greatly disappointed in this nationalization. So some call the parliament approve is politicized. How do you see that situation? Well the American Chamber of Commerce in Mongolia we don’t have a specific view on that transaction. Because we have not been briefed on the facts of what’s going on, we’ve not looked into the specifics. But I can speak to some generalities. Because we certainly do believe the sanctity of the contract and rule of law. One thing that highlights to me is this disappointing cancer that continues to affect Mongolia over and over and over again. And that is a lack of commitment to the rule of law in Mongolia. Instead we have the rule of party. How can something be legal under one government and parliament and illegal under another government parliament. I’m not just talking about Erdenet. Every 4 years we see this since the 1990s. Things are legal and all of the sudden it’s illegal. That’s not a rule of law. If there is rule of law, it would be consistent across the board. I hear some of what’s going on in the standing committee. They are not judges. They are not appointed. Yet they are determining what’s legal and illegal. I’d certainly like to see judicial experts to look into that to make a determination on that. And if it is as again what I’m hearing on TV the development bank gave illegal loans. Why we are punishing the private sector people. They may have received those loans. But it was the government actors who did that. So why are we punishing the private sector for the government misbehaving? So it really opens up a lot of questions about is Mongolia serious about doing business? Is the destination for investment and doing business? And we’re going to start doing it right. Again we don’t have a position on who is right or wrong here. But we certainly have a position on if Mongolia wants to succeed, businesses need to succeed and certainly the circus that’s going on certainly not helping Mongolia. Well it was really nice to talk to you. And thanks for coming. Thanks you so much for having me.